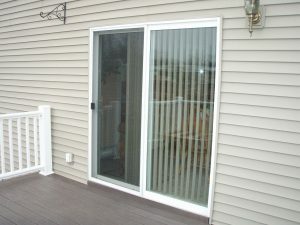 Your sliding glass door is a potential weak point in your home security. While they offer great light and a feeling of spaciousness to your home, they are inherently less secure than a standard door or a wall. Whether that’s through smashing single-pane glass, tampering with usually simple locks or even simply removing the doors from their tracks, they are often the easiest way for an intruder to enter your home. That doesn’t mean you have to give up on your dreams of a sliding glass door, however. There are ways to ensure your security while still having the benefits of a sliding door. Most sliding doors come with latches, but they’re not really designed with top-of-the-line security in mind; they can be brittle and weak. New locks can be installed in the bottom track, which will prevent entry. You can even set it up so that it can be locked in a cracked-open position, allowing fresh air to come in while still providing a layer of security. If your door is made of single-pane glass, it’s relatively simple to break into. There are options to improve this, however – when purchasing a door, look for double-pane or wire-embedded glass; these types are stronger and can withstand more punishment. You can also look into safety window film; this is an add-on to an existing window or door that can greatly improve its strength and durability. Some thieves can simply lift your door off of its tracks and gain entry that way. To prevent that, keep your door well maintained; tighten any loose screws and make sure your rollers are clean. You can install self-tapping screws in the top track, as well. These will allow the doors to open and close, but prevent them from being easily removed without the proper tools. As always, for all your home security needs, trust the professionals. Trust GTA Lockman.